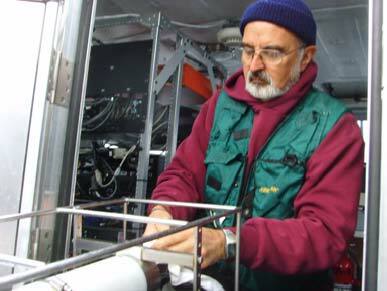 NOAA Teacher at Sea, Gary Ledbetter, helps prepare the CTD for a cast. Take a close look at some of the electronic communication and navigation equipment in the picture above. Which one do you think is the most important? Well, it’s probably not in this picture. Depending on who you ask you will get a different answer as to which piece of equipment is the most important. One would think with the advancements in electronics, it would be the GPS, or some other piece of high tech equipment. Although the most important piece is related to some of the high tech equipment, the instrument itself is not even close to being on the list of the latest and greatest technological equipment – it’s the compass; more specifically the gyro compass. Unlike many things we may feel are rather mundane, the gyrocompass has an interesting history. Apparently taking a patent out for something that doesn’t work is not a new phenomenon because the gyrocompass was patented in 1885 (only about 20 years after the end of the Civil War) by Geradus van den Bos…. and yes, it didn’t work! Four years later, Captain Author Krebs designed an electronic gyroscope for use aboard a French submarine. Then, in 1903, Hermann Anschutz-Kaempfre refined the gyrocompass, applied for and also was granted a patent. Five years later, in 1908, Anschutz-Kaempfre, with the help of Elmer Ambrose Sperry did more research on the compass and was granted an additional patent in both Germany and the United States. Then things started to heat up. Sperry, in 1914, tried to sell this gyrocompass to the German Navy and Anschutz-Kaempfre sued Sperry for patent infringement. As happens today, the attorneys got involved and various arguments were presented. Now it even gets more interesting – Albert Einstein got involved. First, Einstein agreed with Sperry and then somewhere during the proceedings, Einstein had a change of heart and jumped on the Anschutz-Kaempfre bandwagon. The bottom line? Anschutz-Kaempfre won in 1915. A myriad of navigation equipment exists aboard the RAINIER. OK, this history is all well and good, but what does a gyrocompass do that any regular compass can’t do? In a nutshell, a gyrocompass finds true north, which is the direction of the Earths rotational axis, not magnetic north – the direction our Boy Scout compass pointed. Another factor of the gyrocompass is that it is not affected by metal such as the ships hull. Put your Boy Scout compass next to a large metal object and see what happens. Also remember one thing: When you tried to find magnetic north with a Boy Scout compass, you had to hold it very, very still. Try reading a regular compass aboard a ship that is not only moving through the water, but is being tossed about by the waves and currents of the ocean. The gyrocompass addresses this concern also. Without going into a lot of detail (and yes there are a lot of details, even about a compass) friction causes torque, which makes the axis of the compass to remain perpendicular. In other words as the ship rolls and pitches, torque makes the axis of the compass to remain perpendicular to the earth. You then have an instrument that can read true north in nearly all weather conditions. I was a victim! I was a victim of NOAA! In fact, I was a very, very willing victim! NOAA’s safety record is very high and they conduct numerous safety drills to maintain that record and to insure the safety of all aboard. On July 20th I was asked if I wanted to play the “victim” in an upcoming safety drill. Of course I jumped at the chance. I was to play an unconscious fire victim with broken bones. After I staged the “accident” the various medical and fire suppression teams came to my rescue. These drills are very serious part of NOAA’s operation and are taken seriously by the crew – but that didn’t mean I didn’t have fun in the process!! 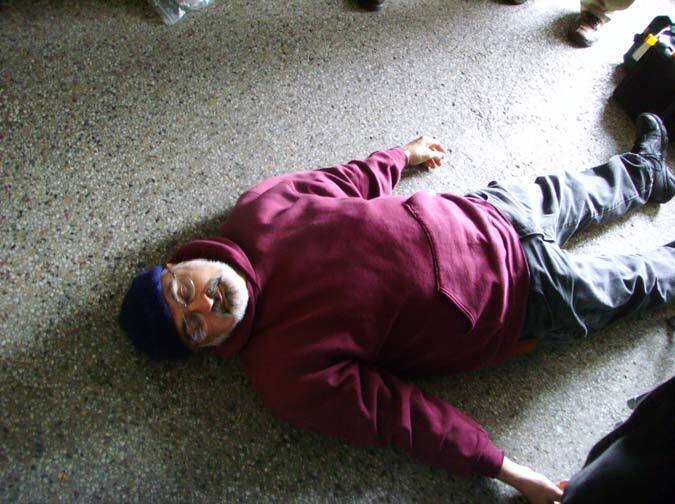 Gary plays the part of the “victim” during a safety drill on the RAINIER. 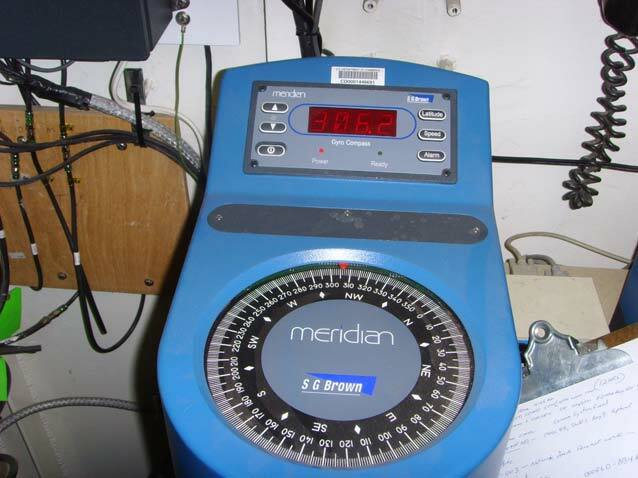 This entry was posted in 2008, Gary Ledbetter, NOAA Ocean Service, NOAA Teacher at Sea and tagged Alaska, CTD, Hydrographic survey, launch, multibeam sonar, navigation, NOAA office of coast survey, noaa ship rainier, pavlov islands, safety drill, sonar. Bookmark the permalink.